Unlike fashion, trends in technology don’t change season to season. Web development technology evolves slowly, gradually improving and then becomes adopted by more agencies, who in turn influence more clients to embrace a new, better way of doing things. So what will be popular in most relevant to marketing managers in 2019? Mobile device sales and usage continue to grow. 74% of people in the UK now use a smartphone (up from 51% in 2012) and 65% of all adults use their smartphone as the primary device to go online. Despite the increase in smartphone and tablet usage, the user experience on mobile is still lagging behind. Why? A lack of Mobile-First thinking. A Mobile-First design approach is when you begin a web project by planning. And designing for the mobile experience first instead of the desktop version. When you start a digital project by designing for the desktop version. Then make it responsive to accommodate smartphones and tablets. It means you are potentially ignoring the characteristics, benefits, and opportunities that make the mobile experience so unique. Designers have to consider the content that users want to the consumer, the smaller screen. And also, the wide variety of functionality that a mobile device can offer compared to a desktop., Such as a camera, gyroscope, GPS, Bluetooth, and Near Field Communication (NFC) features. Consumers are demanding more from their mobile experiences and they won’t hang around if a website or app fails to deliver. 50% of users abandon mobile transactions because of a poor experience. 61% say if they can’t find what they are looking for immediately on a mobile site they will quickly move to another site, and 40% will visit a competitor site according to Google. 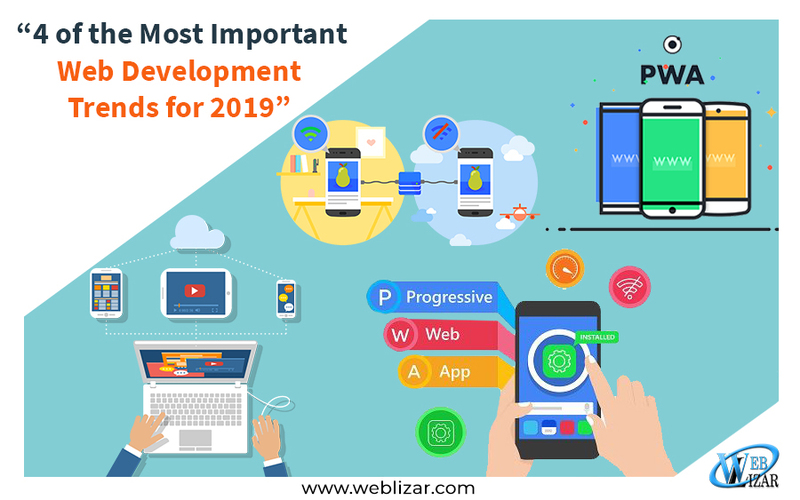 Why Mobile-first design in 2019? Not only will the consumer demand help drive the focus on Mobile-First design. But also the introduction of Mobile-First indexing in 2018. This is where the mobile version of a website is considered the primary version for indexing and ranking. If there’s no mobile site or a desktop version poorly optimized for mobile, it will affect the ranking of the site and affect the organic traffic. PWAs are becoming more popular as clients see the potential of providing the functionality of a native app that is easily accessible via a regular web browser, without needing to download it from an App store. PWAs offer features such as Offline caching (i.e. selected content is downloaded. And can then be viewed offline), home screen shortcuts. And push notifications (currently available on Android). As well as the look and feel of an app environment. Plus, as it’s just a website, there’s no hurdle of an App store, or needing users to sacrifice precious space on their device. The only obstacle holding up the real explosion of growth of the PWA is Apple. Whilst PWAs can be viewed on iPhones, they do not support the Push Notifications as yet, and until they embrace this feature. It may hold back the true full potential of the solution. However, if more and more users are interacting with PWAs, Apple may not be able to ignore this demand. Accelerated Mobile Pages (AMP) are quick loading mobile web pages that serve instant content to users. The project led by Google and Twitter back in 2015 was designed to provide an open source website publishing technology designed to improve web performance. Google stores the content and uses a streamlined code to enable the web pages to load extremely fast. This stripped back version may mean less content, including images, is presented and may compromise your design for speed. Google reports that AMP pages served in Google search typically load in less than one second and use 10 times less data than the equivalent non-AMP pages In May 2017, Google reported 25 million web domains were publishing AMPs with more than four billion AMP pages published globally. Forrester Consulting Total Economic Impact™ study (commissioned by Google) found that AMP leads to a 10% increase in website traffic with a 2x increase in time spent on page. For e-commerce websites using AMP, the study also found a 20% increase in sales conversions compared to non-AMP pages. The true popularity growth of AMPs in 2019 depends on how businesses view the importance of serving information quickly. But with Page Speed being an important factor for both Google and good user experience. It may be a case of identifying what content on a site should be amped up. The HTTP/2 was created with the aim of providing a faster and more secure internet. Originally published in 2015, adoption has been gradual and ongoing with 31.8% of the top 10 million websites supported HTTP/2 as of November 2018. This has been the first update since the initial HTTP was published in 1999. With the increasingly large and more complex content formats now available. A team of Google engineers set out to find faster ways to send content on the internet. They created SPDY, a syntax which builds upon the original HyperText Transfer Protocol (HTTP) and provides the platform for HTTP/2. Whilst the technical details of HTTP/2 can be left for the back-end web developers. It is useful to have a basic understanding of what it does and its benefits. Put simply, HTTP/2 reduces load times by improving the way requests. And responses are sent between a server and the browser. It does this in a number of ways including making connections simultaneously rather than sequentially, compressing and reducing HTTP headers and implementing server pushes. Page load speed is important for both great user experience and for search engine optimization. Therefore any techniques that can improve these are definitely worth considering. Most browsers will only support HTTP/2 over HTTPS to help maintain security, but with sites like Let’s Encrypt offering security certificates, it’s easier to make the switch. But the good news is many websites might already be using it. Google provides a wealth of information on HTTP/2 and read more here if you want to know more on how to implement it. Why will HTTP/2 be a trend for 2019? Users expect instant responses, a site which takes more than two seconds to load is considered slow. And with an increasing demand for the larger and more complex content format. Every opportunity to improve page load needs to be seriously considered. With its minimal cost to implement and the fact that many websites may already be set up on HTTP/2 as part of a server update – find out if your site is already on HTTP/2, it is highly likely that more and more sites will convert to HTTP/2 in 2019.